After the Thanksgiving gluttony yesterday, Jon and I had a light dinner tonight leftovers, paired with the Syncline 2010 Carignan Grenache blend. 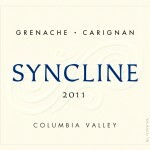 Syncline is a Washington winery, located along the Columbia River Gorge along the border with Oregon. They are family owned, and they purchase their fruit from some of the best vineyards in Eastern Washington. This wine is made with fruit sourced from the McKinley Springs Vineyard. The blend is 64% Carignan, and 36% Grenache, with a clear, dark, garnet color. On the nose, I picked up quite a bit of blackberry and light tobacco. However, this wine is light and fruity when you drink it, rather than having big, tannic, tobacco flavors. There are medium tannins with flavors of blackberry and fresh plums. It is a nicely balanced wine that everybody can enjoy. I’m sure this wine is long ago sold out, as there were only 220 cases produced, and the blend varies from year to year, but you can’t go wrong with any of Syncline’s wines. I wrote about our visit to the winery here, and if you have a chance to visit or try their wines, I would certainly recommend them. After stopping at the main Visitor’s Center at Olympic National Park, Jon and I headed up the mountain for a little hiking at the top of the ridge itself. 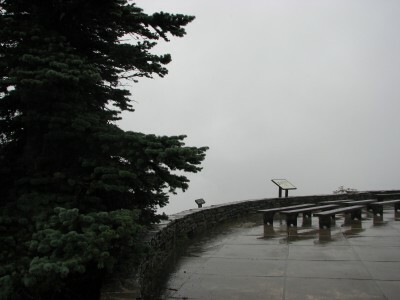 The top of Hurricane Ridge is 17 miles south of Port Angeles, but the road has a lot of twists and turns, so it takes about 45 minutes to get from the Visitor’s Center to the top of the ridge. 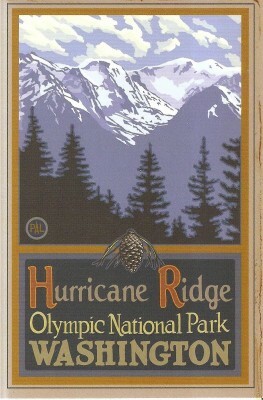 Hurricane Ridge is named for the strong winds that frequent the area, and snow is common even as late as July. With the panoramic views of the Olympic Mountains, it is a popular hiking spot in the spring, summer and fall, and there are skiing, snowboarding and snowshoeing opportunities in the winter. People frequently see wildlife, including deer, elk, bear and a type of marmot that only exists on the Olympic Peninsula. We were eager to see what everybody raves about! 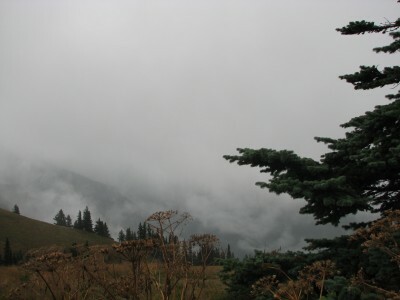 As we began our drive the weather was cloudy but dry, and we stopped at a few of the scenic viewpoints along the way. The view on a clear day is supposed to be spectacular, but with the clouds we couldn’t see out that far. Then, as we were standing there taking some photos, we felt a couple of drops of rain. Now, we both grew up in the Northwest, so a little rain won’t deter us. We got back into the car and continued on our way. Me on our way up to Hurricane Ridge – that smudge above my right shoulder is a raindrop on the camera lens. Soon, we were almost at the top of the ridge, and the skies opened up into a huge downpour! We ran from the car into the Visitor’s Center at the top of the ridge, and in a 20 second run we were soaked! The pictures don’t do it justice, but believe me it was really wet! The “View” from the Hurricane Ridge Visitor’s Center. Awesome, right? There were no eagles flying around in the torrential downpour either! Check out the bears! We never saw any real ones – they were staying inside! 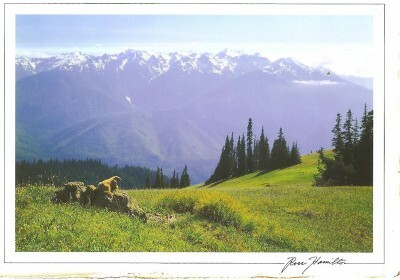 This is what Hurricane Ridge would look like on a clear day. Well, not every day of sightseeing can come off without a hitch… Sigh… The good news is, we have a reason to come again. And I spotted a winery on the way out to the park – we stopped by on the way back! The first day of our Olympic National Park weekend began in Bremerton, Washington, with me wrapping up my conference in the morning. I came back to the hotel just before noon to finish packing up my things while Jon took a shower after his run. 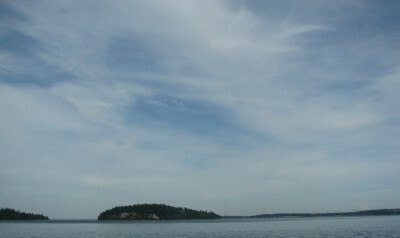 We checked out and then got on the road, heading north to our home for the next few days, Sequim. We stopped for a panini, soup and salad lunch at Panera Bread (don’t you just love their food! ), and then we were on our way! 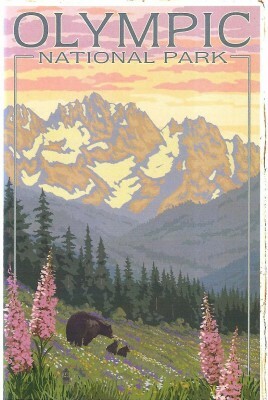 I have always thought of the Olympic Peninsula being a good distance away from our home just south of Canada. To get there from home, we have to drive south, then west, then take a ferry from Coupeville to Port Townsend, then drive to whatever our final destination is. For some reason I just have a mental block about it, even though it really isn’t that far away – so I had never been there, and neither had Jon. But driving up to Sequim from Bremerton was just over an hour, on mostly country highways with light traffic. The sun was shining and the workweek was done, so it was really a pleasant excursion. We got to Sequim and checked into our hotel, changed into hiking clothes, and then headed out to the Olympic National Park Visitor’s Center to try to beat the rain. We knew the weekend would bring some, but in Washington, even if rain is promised, you never really know if it will start, when it will start, how much you will get, or how long it will last. 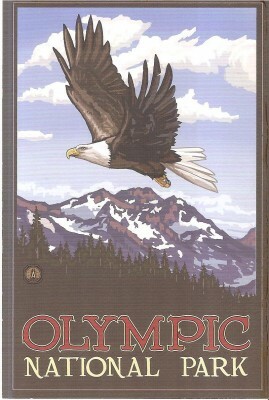 Olympic National Park is a huge park, spanning 922,650 acres, with several entrances, and several Visitor’s Centers. President Theodore Roosevelt designated the area as a National Monument in 1909, and it was changed to National Park status in 1938 by Franklin D. Roosevelt. The park has four distinct ecosystems: coastal, alpine, temperate rainforest, and drier coniferous forest on the east side of the park. The park contains 60 miles of coastline on the West Coast of Washington, rainforests that receive over 150 inches of precipitation annually, and a mountain range with a summit of 7,788 feet, Mount Deception, and a glacier of over 5 kilometers. The main Visitor’s Center at Olympic National Park is just outside of Port Angeles, which is about 15 miles east of where we were staying in Sequim. The rangers there are very helpful, giving you advice on which trails you might want to hike, or equipping you with a bear box if you are going to be camping in the park. 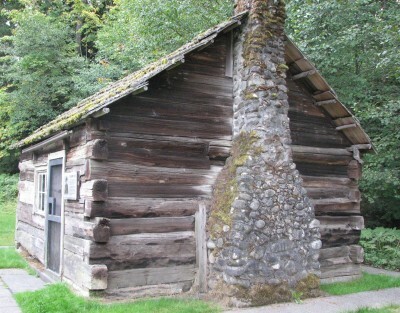 The Visitor’s Center also contains the Beaumont Cabin, a log cabin built by Elliott Beaumont in 1887, on his 160 acre homestead claim. The Front of the Beaumont Cabin – What a Tiny House! 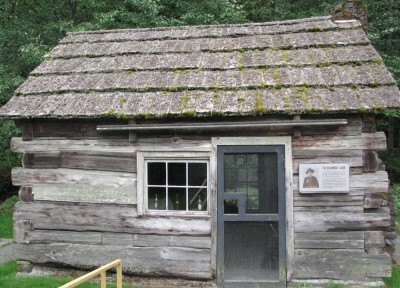 Beaumont lived in the cabin with his wife for almost 40 years. It was donated to the Clallam County Historical Society in the 1960s, and has been restored and furnished with period furnishings. You can peek in and see the decor, and immediately realize how small a pioneer cabin is. It is about 10 feet by 10 feet! You really get a good idea of the phrase cabin fever! After checking out the cabin, it wasn’t raining, so we were ready to head up to Hurricane Ridge to see some awesome views! Back in late September, I was off for a conference in “lovely” Bremerton. The fall conference that is put on by one of the professional associations I belong to alternates between beautiful Chelan (located on a lake in wine country), and not quite so beautiful Bremerton, home to the Puget Sound Naval Shipyard and the Bremerton Annex of the Naval Base Kitsap. In short, it’s a Navy town. Bremerton is located right on the Puget Sound, which makes for some beautiful views, but it has been largely an industrial center and it has struggled in recent years. The downtown area right near the Convention Center has gentrified in recent years, but get out of the immediate vicinity (and by immediate, I mean 2 or 3 blocks) you see the evidence of a community that has had its share of difficulty. There are a ton of empty buildings and ramshackle homes in and right outside of downtown. I call these the Volcano Fountains because they erupt with water at periodic intervals – they are loud and always startle me! 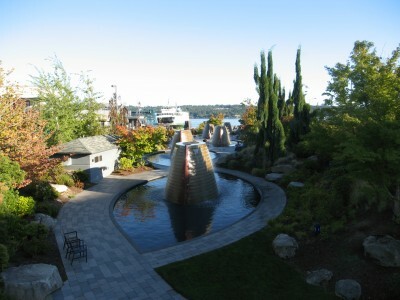 They are right near the ferry dock in downtown Bremerton – an example of the revitalization in the downtown core. However, as we got closer to the weekend, the forecast called for rain. How much would we be able to see and do? Stay tuned! Long day, long week. Today I had an out of town training that meant getting to work at 6 am and home at 6:30 pm. I haven’t had much time to post, but I thought I would share Coraline’s new happy place. The bathroom sink. Apparently she somehow knows it is a good place to give herself a bath. 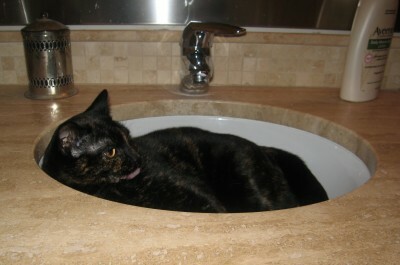 I wonder what she would think if I turned on the water for her!? 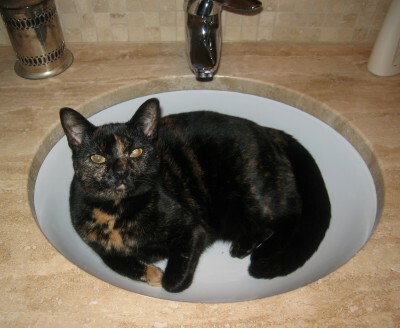 What do you mean you want to brush your teeth? Can’t you see I’m busy!? Happy Wednesday Everybody! I’m more than halfway done with the week! 12 Years a Slave is based on the true story and book written by Solomon Northup in 1853. Northup was a free black man living in Saratoga Springs, NY, with his wife and three children. He made a living working various construction jobs, and supplementing his income working as a violinist. The book details his experience of being lured to Washington, D.C. with the promise of an employment offer, and his subsequent kidnapping and sale into the slave trade. Northup was taken to Richmond, VA and sold as a slave, where he spent the next 12 years working on several Louisiana plantations. The film begins with Northup’s life as a free man, and then quickly escalates to his luring and kidnapping. His free papers are stolen, and he is stripped and dressed in rags, effectively making it impossible for him to convince anybody that he is actually a free man. He is beaten violently each time he tries to protest and insist on his freedom, and his name is changed to Platt Hamilton to prevent him from being traced. Eventually he concludes that the best course of action is to keep his cool and stay alive until he can formulate a plan to escape. Sadly, keeping his cool and staying alive puts him in the same no win situation that most slaves faced. First he is sold to a reasonably benevolent preacher who owns a plantation, where he is treated fairly well. That isn’t to say that the preacher doesn’t have his flaws; another kidnapped free woman is sold away from the plantation when she can’t contain her grief over having her children stolen from her. Soon enough though, the overseer’s contempt for Solomon’s intelligence gets him into trouble – the preacher sells Solomon in order to prevent the conflict from ending in tragedy (in reality, the relationship was more complicated than that; with the overseer owning a significant share of Plat and indebted to the preacher for the remainder). His next owner is a harsh, religious lunatic. While spouting Bible verses, Edwin Epps drinks heavily, sexually assaults Patsey, one of his female slaves, and forces the slaves to participate in bizarre middle of the night dances. He frequently beats and whips his slaves, and his lunatic wife, who can’t contain her jealousy, is an active participant in abusing Patsey. The brutality in the film is raw and realistic. Years in, Solomon meets a traveling carpenter from Canada named Bass, who voices his concerns about the institution of slavery. Solomon decides to take a huge risk and tell Bass his story, and asks him to write a letter to his family and friends back in New York, so they can rescue him. Bass is aware of the risk to himself and Solomon, but agrees to help. The movie is very well done – but it is not for the faint of heart. The portrayal is honest and violent, and leaves little to the imagination. You can feel the pain and desperation. Do see it and bring the tissues. The second day of our weekend in Leavenworth in July, Jon and I got up and got moving so we could make the most of our day. Last fall, when Jon drove over to meet me in Chelan, he had seen an antique store that had interested him. He mentioned it to me and asked if I wanted to check it out. Well, DUH, that’s a silly question! Our first stop was at the Antique Mall at Cashmere (kind of a non-descript name if you ask me), one of the large antique malls in Cashmere, just off the highway. The outside of the store had a lot of architectural salvage that was cool; old window frames, old doors, various garden implements and signs, and we stopped to rummage through that stuff for a few minutes before going inside. Inside the store was a lot of the usual antique store stuff – lots of glass, lots of vintage collectibles, lots of little children figurines, and some really neat stuff too. And then I saw it… The score of the trip… A very large (14″ diameter) glass fishing float. I have admired them for years, but I have never purchased one because they are so expensive, and I have never found one on a beach. But this one was reasonably priced, so I jumped at the chance! 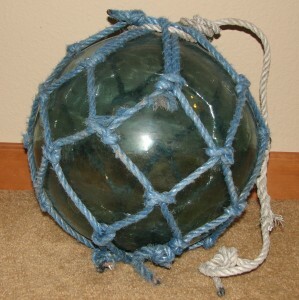 It even has some netting on it. I know nothing about it though, so I will have to do some research at some point… In the meantime though, I just like seeing it perched in on the living room floor. Jon found a vintage record cabinet that he loved, and it was also priced to sell. It was small enough to fit in our Honda CRV with all of our other trip gear, so it went home with us too. After the Antique Mall at Cashmere, we stopped by the other antique mall – Apple Annie’s. This place is gigantic, with over 70,000 square feet and a restaurant in the building. The building is new, so it has a different feel than many antique malls that are in old buildings with uneven, creaky floors and poor lighting. Jon saw a 1950’s style coffee table that he liked, but there was nothing there that we had to have. 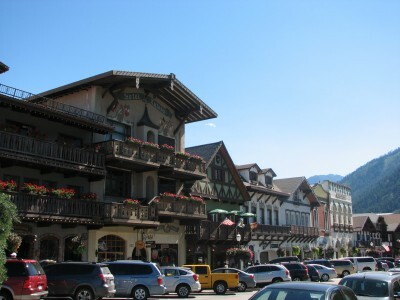 We cruised through the last several aisles quickly because we were getting hungry, and we were going to meet the family for lunch in downtown Leavenworth. Leavenworth was a zoo that day. There were so many people everywhere! Jon got pretty frustrated with the crowds… Plus it was really hot! For lunch we had brats, pretzels and water at the Leavenworth Sausage Garten. I had a regular Bratwurst and Jon had a Veggie Brat – they were both delicious. We split one of their pretzels, which was awesome! The seating is outdoors, with umbrellas over the tables to provide some shade in the summer, and outdoor propane standup heaters to give some warmth in the winter. The day we were there, the misters were spraying a light mist of water on us, keeping us a little cooler. After our brats, we checked out the shops in downtown Leavenworth, and thought about a visit to the Nutcracker Museum. Those of you who read this blog know that I am a sucker for a museum, and I have heard that the Nutcracker Museum is good – I just wasn’t in the mood for a museum after poking around in antique stores for hours. I’ll be back at some point though. We did make a visit to the Icicle Ridge Winery tasting room, located in the basement suite of one of the main street buildings. Surprisingly, there was no one else there when we went to do our tasting. 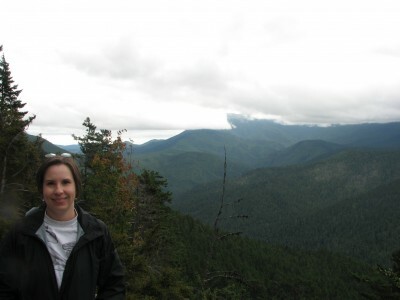 I’ll talk about Icicle Ridge in another post! 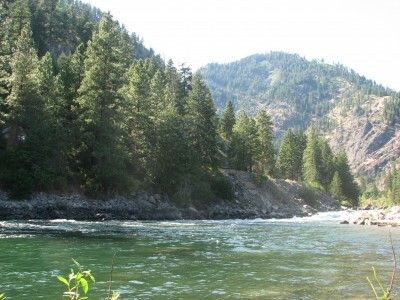 After a bit more wandering around, we decided it was time to head back to the cabin to beat the heat in the river. 100 degrees was too hot for any of us to handle! We got our swimsuits on and jumped into the ice cold Wenatchee River. Our cabin was just below a section of rapids that made an interesting “bathtub drain” effect in the water. When you first jumped in, you would be pulled towards the rapids to the north (the rapids were uphill though, so you didn’t go tumbling over any falls or anything). Then you would swim further out into the river, to be caught up in the rush of water that would quickly carry you south past the cabin. Once the speed of the water slowed down, you could swim closer to the riverbank again where the river would carry you back to the north once again where you could get back out of the current near the cabin. It took some strong swimming, but it was pretty fun going through the cycle! We all enjoyed a dinner of BBQ’d steak and chicken, with salad, green beans and other sides, and chatted the evening away around the table. 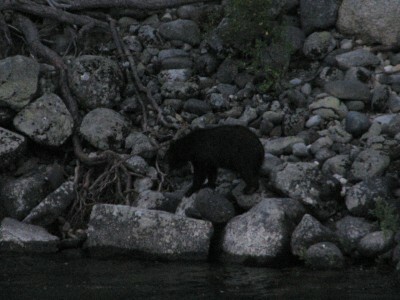 The highlight of the evening though was seeing a black bear come down to the water on the opposite riverbank! He wasn’t fully grown, but old enough to have been weaned from mom. What a treat to see him! He was far enough away to not make you nervous (on the other side of the river was good for me), so unfortunately with the low light it was hard to get great photos of him. I will remember the experience though! We Saw a Black Bear! A fantastic day in Leavenworth ended with a dip in the hot tub (the temps drop fast when the sun sets) and a puzzle spread out on the coffee table in the cabin. Can’t wait to visit again! 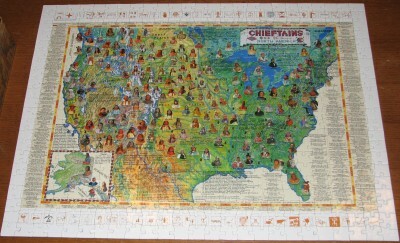 Our Evening Puzzle Project – Of Course it has a History Theme!